East Bergholt is a large, scattered parish, not far from the Essex border. It has more pubs than any other village in Suffolk - and more tourists too, for it is home to Flatford Mill and the John Constable industry. Because of this, the medieval parish church of St Mary has more visitors than most. It has a spectacular exterior, typical of the wealth brought by the 15th century cloth industry to this part of England. It does not have one of Suffolk's more interesting, historical or beautiful interiors. But visitors come anyway. As they leave, some must wonder at the large cluster of 19th century buildings beyond the graveyard. Was it a hospital? Was it a workhouse? 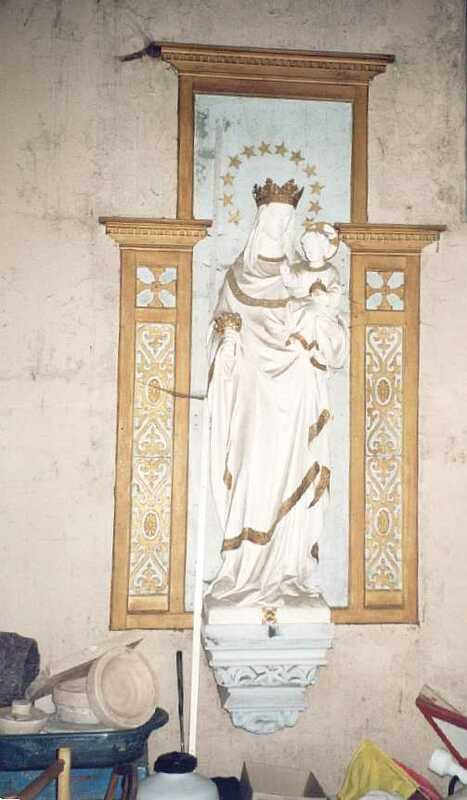 The statue of the Blessed Virgin that regards the church from above an entrance suggests that it was neither. Wander around it, and you will find, to your surprise, a splendid 18th century manor house around the back. This is Old Hall, one of Bergholt's ancient manors. What happened here? In the middle of the 19th century, this rural seat grew rapidly. To what purpose? There's a story here, which is bigger than this place alone. One night, in November 1862, an anti-Catholic riot took place on the streets of Ipswich. Whipped up into a frenzy by firebrand Protestant tub-thumpers, the mobs ran through the town, smashing and looting Catholic-owned businesses, and stoning Catholic houses. They stormed up the lower Woodbridge Road, then as now an area with a large Catholic presence, and besieged the church of St Mary. The Sisters of Jesus and Mary in the adjacent convent rescued the blessed sacrament, took it back into their chapel, and huddled around it in prayer while the fury of the mob fell around the building. 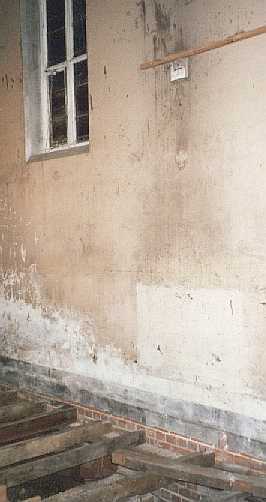 Every single window in both church and convent was destroyed. How could this have happened? For you will remember that, a little over a half-century before, Catholics escaping the terror of the French Revolution had been welcomed with open arms in England. This was partly because the British state feared a revolution here, but also because of the London anti-Catholic pogrom of 1780, which resulted in hundreds of deaths. The shamefulness of this event had been a catalyst for a greater sense of social responsibility by established Church and State. French clerics and religious communities fleeing here in the 1790s found a sympathetic welcome. The new tolerance led to further reform acts, which by the 1830s gave English Catholics broadly equal civil rights. The Catholic population continued to increase, and by the 1851 census of religious observance it had reached more than a million. Even so, the Catholic Church in England had the status of a mission church; there was no hierarchy of Archbishops and Bishops, no Dioceses or Cathedrals. Instead, the country was divided into districts, and the Priests and people in each district were looked after by a Vicar-Apostolic. In 1851, full of confidence about its growth, and conscious of the increasing need of its flock, the Catholic Church decided to re-establish itself properly in England, and restore the hierarchy. In the triumphalist declaration From Without the Flaminian Gate, Cardinal Wiseman, formerly Vicar-Apostolic of the London District, but now the first Archbishop of Westminster, unfurled his plan for the reconversion of England. It was a public relations disaster. Charles Dickens, a rabid anti-Catholic, fumed and fulminated in the pages of his Household Words magazine. Punch, another virulently 'anti-papist' publication, portrayed the return of the Catholic hierarchy as an attempted foreign invasion. It occupied the business of Parliament for weeks, and there were many calls for Wiseman to be tried for treason. Ironically, the Catholic Church had decided not to re-establish its Bishops in their former sees, because it was thought that this might inflame public opinion. Instead of Canterbury, Wiseman was sent to Westminster. Other seats were chosen for Bishops near to former Diocesan seats; usually, they were large urban centres with some Catholic historical resonance. Thus, Newcastle was chosen instead of Durham, Liverpool instead of Chester, Leeds and Sheffield instead of York, Northampton instead of Peterborough and Ely, and so on. Many of these cities would be used by the Anglican Church for new Bishops later in the century. But what on earth has all this got to do with a former Manor House in deepest East Anglia? Well, in 1790, at the height of the French Revolution, a community of Benedictine Nuns returned to this country. The community had been established in Brussels in 1599, by daughters of families fleeing the terror of the Elizabethan persecution in England. Two hundred years later, the pendulum had begun to swing the other way, and they established their community at Winchester, in Hampshire. By the late 1840s, and the ferment in Catholic activity that would lead to the restoration of the hierarchy, the community had grown to such an extent that it was decided to seed it elsewhere. The Order turned its eyes to the Diocese of Northampton, and in particular to East Suffolk, where its cell at Stoke Priory was able to report that a large estate in the nearby village of Bergholt was up for sale. Old Hall had been the home of the Godfrey family for most of the century. Arriving in Bergholt in 1806, Peter Godfrey eventually bought up almost the entire village. He developed the farming methods used in the four manors, and regularly invited his close friend John Constable to paint in the park. But the years were not kind to the Godfreys, and their children married, moved away, and the family died out. The manor was put up for sale, and the Benedictines bought it. What did they get for their money? The mansion was a handsome one. It had been built by the Chaplin family in the early years of the 18th century, on the site of a former Elizabethan house. This had been lived in by Cardinalls and Parkers, but the most important family to have owned the Manor, and the ones who built the Elizabethan Hall, were the De Veres, who we have also met at Lavenham. They probably didn't actually live here, but you can see their star on the rood turret of East Bergholt's parish church, St Mary, which they knew as a Catholic church and as a Protestant one. The De Veres left East Bergholt in 1579. And so, Old Hall became the Convent of the Assumption of the Blessed Virgin Mary. Although the house was bought by the sisters in fairly good condition, it was not entirely suited to their purpose. In keeping with the spirit of the times, they commissioned a major architect to refurbish and extend the house. George Goldie is perhaps best known for St Mungo's Catholic Cathedral in Glasgow, and for the church of Our Lady of Victories in Kensington High Street, which served as Wiseman's pro-cathedral in the days before Westminster Cathedral was built. Goldie was also responsible for the interior of Newcastle Catholic Cathedral, and for many other churches, mainly in the north of England and Scotland. He is considered today today to have been one of the most influential architects working in the Gothic revival of the mid-19th century. He set to work on his conversion project. In 1856, he added a splendid chapel, with a chapter house for the Sisters to meet in, a substantial Italianate bell-tower, and a lay chapel at right angles to the main chapel, so that local Catholics could participate at Mass. Afterwards, George Goldie stayed in the area, designing the vast Convent school of Jesus and Mary on Ipswich's Woodbridge Road, and then the town centre church of St Pancras, a triumphalist Catholic statement. It was the building of St Pancras that led to the Ipswich anti-Catholic riots. At Bergholt, the sisters farmed the land, and were pretty well self-sufficient. At first, the community was run as a school, but in 1876 the school closed, and the Order retreated, to become an enclosed, contemplative community. 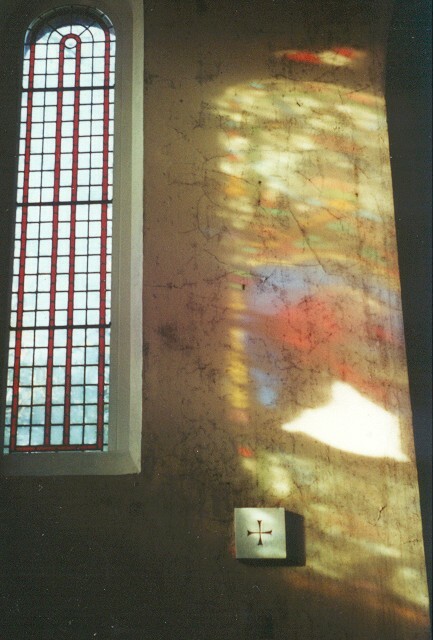 The chapel was considerably enhanced with stained glass, and a marble altar. As an enclosed order, they did not mix much with the villagers, but achieved a quiet acceptance. Apparently, they often participated in village events, like agricultural shows, and in times of hardship were able to provide charity. The farmlands were extended, and successfully cultivated. Their main outside income came from making church vestments. The Sisters also baked their own bread, made their own wine and beer, kept bees, and made butter and cheese. It sounds an idyllic life. The Protestant Truth Society didn't think so. Brenda Gamlin, in her excellent Old Hall: the Story of a Suffolk Manor (details below), recalls an incident in the early years of the twentieth century. An escaping nun was, supposedly, chased by other members of the community all the way to Brantham railway station, where the station master bundled her on to a train, and held back the papist hordes. The Protestant Truth Society published the grilsy details in a book, and gave the station master a medal. It would be fascinating to know the story behind it all. Much of the life of the community, however, seems to have been marked by a lack of incident. And so it continued, into the 20th century. In 1939, the outbreak of the Second World War put East Bergholt in a restricted area, being so close to the coast. When the danger of invasion came in 1940, the Sisters were evacuated by their Order. The experience of Europe had shown that the Nuns would not be treated mercifully by the Germans. Like many large houses, Old Hall was requisitioned for military use. And, like most, it was treated shamefully. By the end of the War, it was in a terrible state. This, and a decline in numbers brought on by changes in the role of the Order, meant that the Sisters decided not to return to Bergholt, and Old Hall was put up for sale. The rest of the Sisters' story is soon told. Brenda Gamlin informs me that, after spending the War scattered around the country in small groups, they regrouped at Haslemere in Surrey. In about 1987, the last remnants of the community there disbanded. The surviving sisters retired to St Scholastica's Abbey,Teignmouth, where Brenda Gamlin traced them when she was researching her book. Brenda tells me that she had a happy correspondence with Sr Agnes Jospeh, who has since died, the last of the East Bergholt sisters. In 1945, the Bishop of Northampton had directed the attention of the Franciscan teaching order to it. The Franciscans were a burgeoning strand of the Church, and the increase in vocations brought on by the end of the War created a desperate need for new premises for a college to train men for the Priesthood. Although Old Hall was not ideal, it was as good as they were going to get under the circumstances, and they bought it. They patched it up, and eventually planned to rebuild and expand; however, this never happened. But Old Hall took on a new life, becoming much more integrated into the local community. The Franciscans provided a ministry for the local Catholic parish of Brantham, and later for the new Ipswich parish of St Mark. Their annual fetes became a Bergholt institution. And so it might have continued. But then, the Second Vatican Council happened. This vast early-Sixties explosion of ideas had a considerable fallout in the English Catholic Church. Religious Orders were encouraged to leave their cloisters, and go out into the world. In addition, the training of Priests would no longer happen behind high walls in remote outposts, but in a proper, rarified academic atmosphere. The Franciscans applied to be a part of the new University of Kent at Canterbury, and left Old Hall. A small group remained at St Mark until the late 1980s. Shortly before their departure from Old Hall, the BBC broadcast Mass from the chapel. Perhaps this event was the highest point in its century-long existence, a symbol of the way in which the private liturgical space of an enclosed order had been opened up to the world. But in 1973, Old Hall was put up for sale. What possible use could be found for such a vast building? Today, no doubt, it would be partly demolished, and the remains converted into executive flats; nearby Manningtree station would be handy for London commuters, and the site would be worth millions to the right developer. Thankfully, this didn't happen. A private school showed great interest in taking the premises on, but instead, some local families bought it together, with a view to developing it as a community. This they established on June 14th 1974. To define the ideas is as hard now as it was then, for there never has been one binding aim or ideal. We share a common concern for environmental and ecological matters, we work towards a degree of self-sufficiency and we farm organically. Most of us came looking for an alternative lifestyle, a greater degree of companionship and wider opportunities to lead a more varied and fulfilling life than had previously been possible in our isolated families. We have hoped to promote by example rather than by preaching the idea that living a more simple, sharing life is progress, not regression. Everyone agrees that it is a wonderful place for children to grow up in, in freedom, warmth and security. And so, the community was formed, and grew, and prospered. And it survives today, having recently celebrated its 25th 'Completion Day', a day of great festivities and rejoicing. The community numbers about 60 people, from toddlers to pensioners. At first sight, the modern community is a secular one, after more than a century of religious life. Anyone reading Brenda's words carefully, though, will see that that this is an entirely Christ-like endeavour. So let us go, then, through the gate into the yard, where the chickens scratch and watch us warily, and into Old Hall itself. On a cold day, you step into a cosy warmth. A line of muddy boots stand guard inside. Comforting smells come from the former refectory, now a kitchen and dining area converted for the needs of the community. Beyond, corridors lead into the mansion itself; wide and wood-panelled, with windows on one side and large doors into large rooms on the other. Even with their carpeting, and the plants on the window ledges, it is easy to imagine the Victorian Sisters moving silently along them. Turning back to Goldie's extension, we head north into the former Chapter house. At once, the temperature plummets, for this part of the Hall is not heated. The Chapter House is a large rectangular room, with a wood-panelled apse at the north end. Here, the senior members of the Chapter sat, flanking their Superior, while the other Sisters sat in the body of the room. Today, this space is used for recreation by the younger members of the Community. 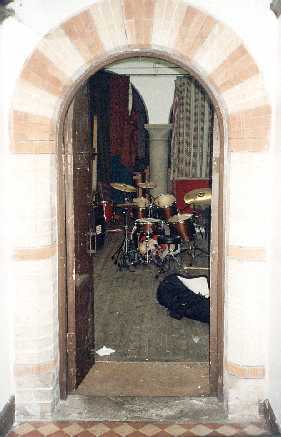 Large double doors are set in the west wall of the room, and you step through them into the chapel itself. When I first visited this building about 15 years ago, it was on a warm summer day, and the chapel was full of coloured light. Piled-up storage boxes flanked the walls, and the high windows sent beams of spiralling dust dancing above them. On my most recent visit, on one of the coldest, dampest days of the winter, it was like stepping into an abandoned cold-store. The chapel was emptier, untidier than I remembered it, and I picked my way tentatively in the dark, avoiding the missing floorboards, which are awaiting repair.. The chapel has always been a problem for the community. After the Franciscans left, it was deconsecrated, and used for a variety of community purposes. But it is too big; and, although it is treated with love and affection, it is impossible to heat, so that it is not really suitable for much in its present form. In 1982, the marble altar was sold to another church, and the furniture has been redistributed for use elsewhere in the community, but many original fixtures survive in situ. 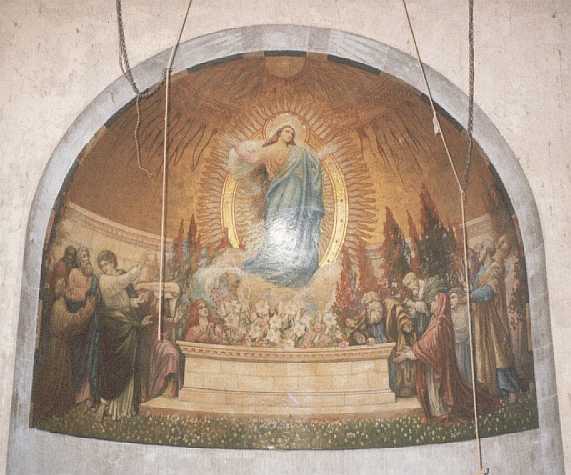 Most striking is the large painting of the Assumption in the top of the apse at the west end (the usual liturgical layout is reversed here). The altar once stood below it, and it formed a baldachino. The artist Edward Ardizzone, in his memoirs, recalls serving here as an altar boy. 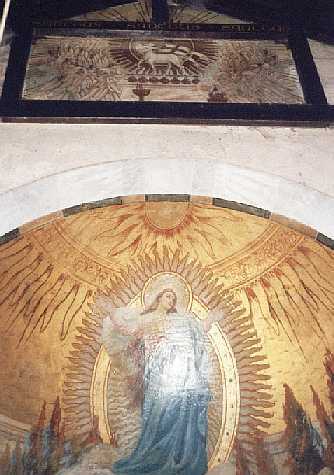 The colours of the Assumption painting are rich, even after a century; the gold leaf shines, and the reds and blues glow. Above it, a curious wall painting presents the Lamb of God, and at the other end of the chapel, above where we came in, it is reflected by a triptych commemorating the foundation of the Order in 1599, and some event, unknown to me, in 1925. Along the walls, consecration crosses survive between the arched windows. The stained glass in the windows is of a fairly perfunctory kind in the Early English style, familiar from many churches of this period. 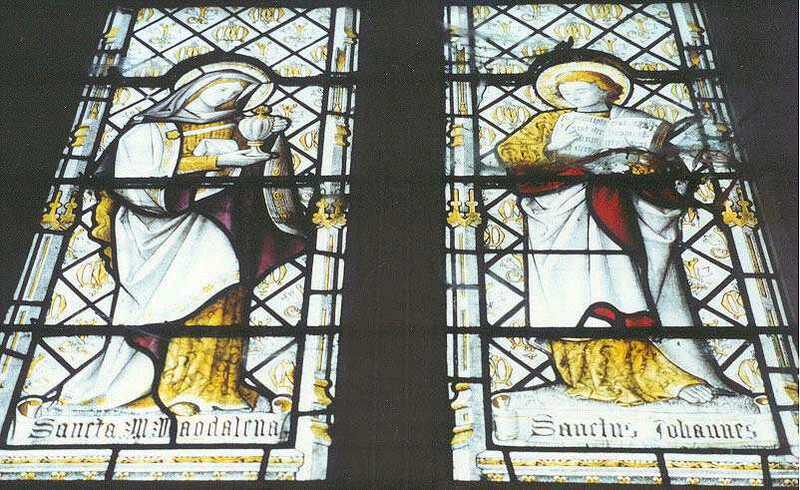 However, the two lancet windows that stand to the south of the apse once contained great treasures. When I first came here in 1987, they shone with the vivid blocks of colour so beloved of the Arts and Crafts Movement, for they were the work of Margaret Rope, one of the Rope cousins. The Ropes were among the finest female stained glass artists of the 20th century, and remarkable women indeed. My friend Arthur is their nephew and cousin, and he lives in the Old Hall Community. He has spent a great deal of time and effort in tracking down their work from all over the world, and the fruits of his labours can now be seen on the Rope cousins website. In 1995, the two windows were removed from Old Hall chapel, and reset in the extension of the beautiful church of the Holy Family and St Michael at Kesgrave, itself the work of the Rope family, commemorating the death of Margaret's brother Michael in the R101 disaster. A rather more startling survival is the statue of Our Lady of the Immaculate Conception, that still stands on the south side of the chapel. Directly opposite it is the lay chapel, a narrower room that opens into the main body of the chapel. At its far end, a doorway leads out into the village High Street. There are plans for the chapel. One possibility is that it could be converted in some way for residential use, with the lay chapel retained as an exhibition space. It remains a grade II listed building, so this would need to be done sensitively, and with all the correct procedures. It would be sad to lose its original integrity, but it is hard to see its current state as being one worth preserving. Old Hall is well known in south Suffolk and north Essex. The modern community has carried on at least one tradition of the Franciscans, and their summer festival attracts visitors from miles around. There is music, there are children's games, and story-telling and theatre; the crowds mill in the fields that Constable painted. And yet, I always find myself wandering off, exploring the grounds of this extraordinary crucible of Suffolk history. So many 19th century buildings in the world have been entirely reinvented; but this one hasn't. Here, we still find a building laid out for community use; for the purposes, if they will forgive me the word, of an institution. On such a day as this, the present fades, and the Sisters walk easily again, through halls and along corridors, down hedged paths to distant fields. The cheeses still mature on the shelves in the dairy, the fruit ferments for the wine. The bees still keep their backing drone to the percussion of today's transient pleasures. Then, time slips, and the spirit of the past is alive again. Such charming, friendly ghosts. 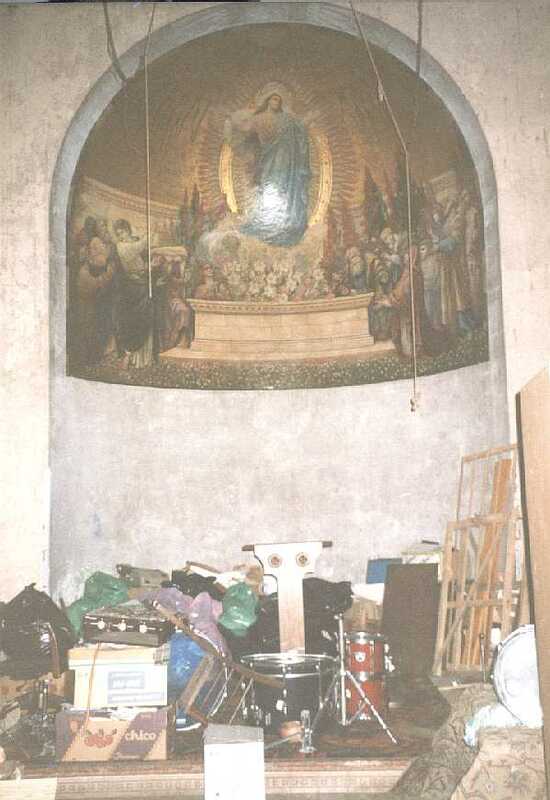 Postscript: In 2004, Arthur Rope told me that "the chapel is now being restored for multifunctional purposes - i.e. it will be useable for concerts, exhibitions, dances, indoor sports. Basically, the space has been cleared, the staging removed and the floors reconstructed underneath, the walls repaired and painted (all huge undertakings) and now the floor tiles are being cleaned preparatory to being polished / sealed." I revisited in the summer of 2009 and found it in perfect condition and in use as a community space. However, please note that the chapel is part of the premises of the Old Hall community. This is a private residence, and the chapel is not ordinarily open to the public. I am totally indebted to the wholly excellent Old Hall: the Story of a Suffolk Manor, by Brenda Gamlin, and unreservedly recommend it to anyone interested in the history of this curious corner of Suffolk. It can be obtained for £4 including postage (£5 outside UK) from Brenda Gamlin, Old Hall, East Bergholt, Colchester, CO7 6TG. Cheques should be made payable to Brenda Gamlin. Also available from the same address is The Patchwork History of a Community Growing Up, which tells the story of the Old Hall community. This is £6 including postage (£8 outside UK). My thanks to Arthur Rope and Brenda Gamlin for their help with this entry, and also to Sue Sharp for all her kindness. Please note that some of the photographs are by Arthur Rope, and retain his copyright.